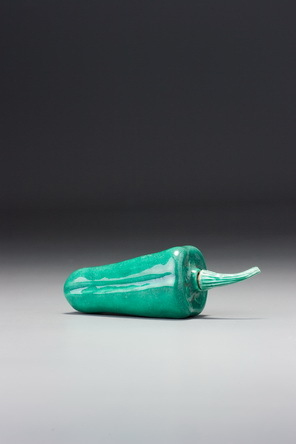 Among the many bottles made for a non-imperial market during the nineteenth century is a range of monochrome wares, some of which are of fruit forms, including this unusual pepper. Many of them were obviously mass produced, and some are so crude one is tempted to think they were made as disposable containers in which to sell medicines. 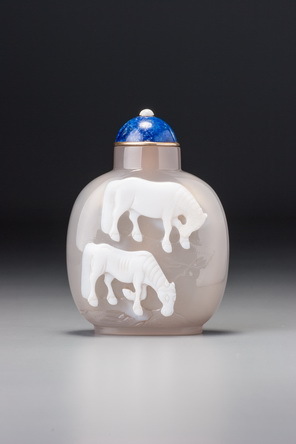 This version, however, is at the high end of the scale, being thoughtfully sculpted, well made, and finely glazed with a typical nineteenth-century Jingdezhen glaze. It forms part of a range of moulded monochrome fruit forms that are difficult to date, but that were probably made from the Jiaqing period through to the end of the century. The unglazed interior may indicate a date from earlier in the century, but there are too few of this type in our modern collections to allow much of a study of their interiors. This type of fairly opaque, thick, crackled green glaze appears on a range of later- Qing monochrome ceramics, many of them miniature vases that may have been used as snuff bottles. But this well-conceived vegetable form is a rarity, the more so because of its intact original stopper, the length and delicacy of which should have presaged its early destruction.